When it comes to non-Apple platforms, nearly half of polled iOS developers – or 47 percent – write Android apps and more than a third (36 percent) develop for Research In Motion’s BlackBerry. Microsoft’s Windows Phone 7 and Hewlett-Packard’s webOS get little love from developers, with only 13 percent and seven percent supporting those respective platforms. 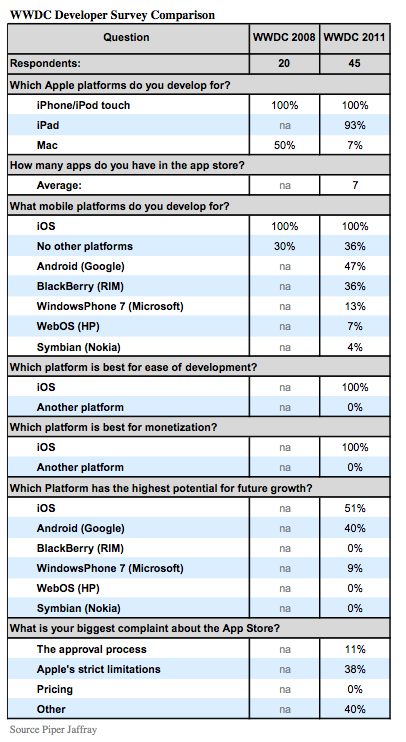 Worse, not a single developer named RIM or HP when asked to single out platforms they thought could grow in the future. It’s all coming down to the iOS/Android duopoly, with 51 percent thinking iOS has the highest potential for future growth and 40 percent for Android (Windows Phone scored nine percent on that question). It’s also interesting that 36 percent are developing exclusively for iOS, up from 30 percent in 2008. Symbian? Four percent develop for that. Every single one iOS developer says Apple’s platform is best for ease of development and monetization. And asked about app rejections, 38 percent pointed out Apple’s strict limitations as their biggest complaint about the App Store, but only 11 percent – or one in ten – are dissatisfied with the approval process per se.